The Cell Signal Unit studies various molecular and cellular events that are important for maintaining healthy life in response to environments. The Unit explores the cause of various diseases that include cancer, neuronal disorder, immunological diseases, and diabetes/obesity at the molecular level. To approach these issues, the Unit characterizes regulation of gene expression at the level of RNA that includes micro RNA, mRNA and long non-coding RNA. The Unit also characterizes cell signaling with special interest on control of the brain function such as emotions, learning and memory. o For I: Representative director Kuniaki Nerome, Bioresource Laboratory LLC. • Researchers: Dr. Kazumasa Yokoyama, Takeda Pharmaceutical Company Ltd.
3.1 The CCR4-NOT deadenylase activity contributes to generation of induced pluripotent stem cells. Somatic cells can be reprogrammed as induced pluripotent stem cells (iPSCs) by introduction of the transcription factors, OCT3/4, KLF4, SOX2, and c-MYC. The CCR4-NOT complex is the major deadenylase in eukaryotes. Its subunits Cnot1, Cnot2, and Cnot3 maintain pluripotency and self-renewal of mouse and human embryonic stem (ES) cells and contribute to the transition from partial to full iPSCs. However, little is known about how the CCR4-NOT complex post-transcriptionally regulates the reprogramming process. Here, we show that the CCR4-NOT deadenylase subunits Cnot6, Cnot6l, Cnot7, and Cnot8, participate in regulating iPSC generation. 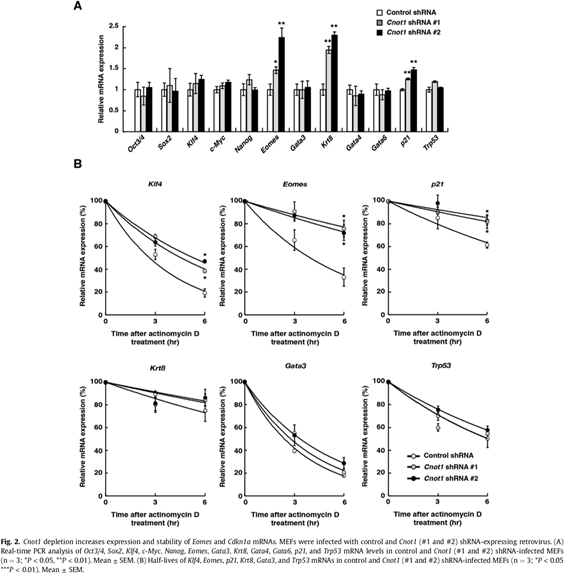 Cnot1 knockdown suppresses expression levels of Cnot6, Cnot6l, Cnot7, and Cnot8 in mouse embryonic fibroblasts (MEFs) and decreases the number of alkaline phosphatase (ALP)-positive colonies after iPSC induction. Intriguingly, Cnot1 depletion allows Eomes and p21 mRNAs to persist, increasing their expression levels. Both mRNAs have longer poly(A) tails in Cnot1-depleted cells. Conversely, forced expression of a combination of Cnot6, Cnot6l, Cnot7, and Cnot8 increases the number of ALP-positive colonies after iPSC induction and decreases expression levels of Eomes and p21 mRNAs. Based on these observations, we propose that the CCR4-NOT deadenylase activity contributes to iPSC induction. 3.2 Structural basis for inhibition of the deadenylase activity of human CNOT6L. Human CNOT6L/CCR4, a member of the endonuclease-exonuclease-phosphatase (EEP) family enzymes, is one of the two deadenylase enzymes in the conserved CCR4-NOT complex. Here, we report inhibitor-bound crystal structures of the human CNOT6L nuclease domain in complex with the nucleotide CMP and the aminoglycoside neomycin. Deadenylase activity assays show that nucleotides are effective inhibitors of both CNOT6L and CNOT7, with AMP more effective than other nucleotides, and that neomycin is a weak deadenylase inhibitor. 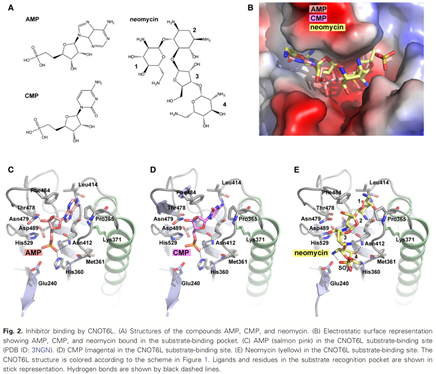 Structural analysis shows that all inhibitors occupy the substrate and magnesium-binding sites of CNOT6L, suggesting that inhibitors compete with both substrate and divalent magnesium ions for overlapping binding sites. Kureha, T. (2016). Deadenylase-mediated poly(A) shortening regulates the maintenance of regulatory T cells. The 2nd Meeting of Osteoimmunology. Hotel Monterey Okinawa Spa & Resort. Kureha, T. (2016). Deadenylase-mediated poly(A) tail shortening regulates the positive selection of thymocytes through post-transcriptional down-regulation of ASK1. 46th Annual Meeting German Society for Immunology, Hamburg, Germany. Kureha, T. (2016). Poly(A) shortening of ASK1 mRNA contributes to positive selection of thymocytes by impairing TCR-induced stress response. The 8th Sinal Network Conference Research Institute for Microbial Diseases, Osaka University. Kureha, T. (2016). Poly(A) shortening of ASK1 mRNA contributes to positive selection of thymocytes through impairment of TCR-induced stress response. International Congress of Immunology 2016. Melbourne. Kureha, T. (2017). Roles of the CCR4-NOT complex in T cell differentiation and cancer immune regulation. OIST, The 5th CCR4-NOT Meeting. Matsuura, K. (2016). SPAL1 interacts with the Neurabin family of proteins and is involved in the regulation of G Protein-Coupled Receptor signaling. Pacifico Yokohama, 39th Annual meeting of the molecular biology society of Japan. Mohamed, H. (2017). CNOT1 regulation of eukaryotic circadian rhythm through post-transcriptional mechanisms. OIST, The 5th CCR4-NOT Meeting. Mohamed, H., et al. (2016). CNOT1 regulates eukaryotic circadian molecular clock through post-transcriptional mechanisms. Pacifico Yokohama, 39th Annual meeting of the molecular biology society of Japan. Montrose, K. (2016). 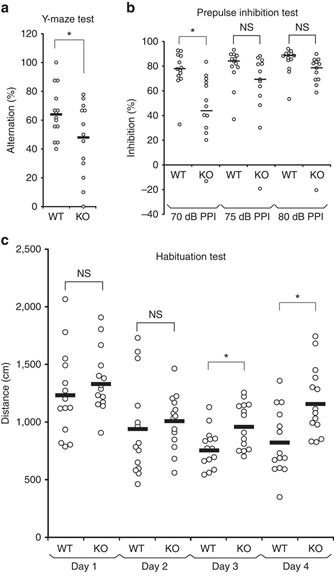 Lmtk3 knockout mice exhibit schizophrenic-like behaviour. Hawaii, USA, 4th Annual Molecular Pyschiatry Meeting. Montrose, K. and T. Yamamoto (2016). Lmtk3 knockout mice exhibit schizophrenic-like behaviour. Pacifico Yokohama, 39th Annual meeting of the molecular biology society of Japan. Sarma, H. (2017). Physiological and Molecular basis of CNOT9. OIST, The 5th CCR4-NOT Meeting. Sarmah, H., et al. (2016). Role of CNOT9 in early T-cell development. Pacifico Yokohama, 39th Annual meeting of the molecular biology society of Japan. Shirai, Y.-t., et al. (2016). Functional analysis of CNOT3 in non-small cell lung cancer. Pacifico Yokohama, The 75th Annual Meeting of the Japanese Cancer Association. Suzuki, T., et al. (2016). Pacifico Yokohama, 39th Annual meeting of the molecular biology society of Japan. Suzuki, T., et al. (2016). CNOT6 and 6L are dispensable for keeping viability of MEFs and liver function. RNA2016, ICC Kyoto (Kyoto International Conference Center). Takahashi, A. (2017). Deadenylation regulates mRNA stability and transcription activity. OIST, The 5th CCR4-NOT Meeting. Takahashi, A., et al. (2016). Obesity and mRNA decay. RNA2016, ICC Kyoto (Kyoto International Conference Center). Takahashi, A., et al. (2016). Poly(A) tail length-dependent regulation of mRNA decay rate and transcription activity. Pacifico Yokohama, 39th Annual meeting of the molecular biology society of Japan. Takaoka, S. (2017). Feedback control of transcription by mRNA decay factor. OIST, The 5th CCR4-NOT Meeting. Takaoka, S., et al. (2016). Mathematical modeling of deadenylation dependent mRNA decay. ICSB 2016. Barcelona, Spain. Takaoka, S., et al. (2016). Pacifico Yokohama, 39th Annual meeting of the molecular biology society of Japan. Yamamoto, T. (2016). The CCR4-NOT deadenylase: a key player of novel paradigm of gene regulation. Institute for Advanced Biosciences, Keio University. Yamamoto, T. (2016). mRNA biology in life. RNA Granule. National Istitute for Basic Biology. Yamamoto, T. (2016). mRNA Biology -The CCR4-NOT deadenylase: a key player of novel paradigm of gene regulation-. RIKEN Center for Integrative Medical Sciences. Yamamoto, T., et al. (2016). Pacifico Yokohama, 39th Annual meeting of the molecular biology society of Japan. Yamamoto, T., et al. (2016). The CCR4-NOT deadenylase: a key player of novel paradigm of generegulation. The 89th Annual Meeting of the Japanese Biochemical Society. Tohoku University. • Venue: OIST Campus Center Bld.